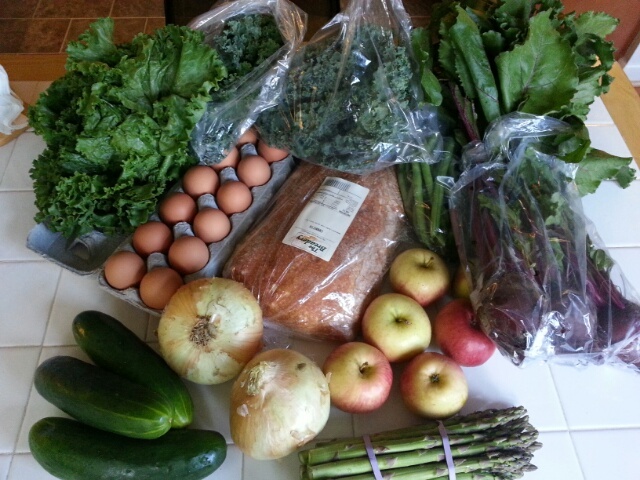 For the final week of this year’s spring CSA, we had: beets, apples, asparagus, Vidalia onions, cucumbers, green leaf lettuce, kale, green beans, eggs, and bread (Breadery sourdough). Saying goodbye to the spring CSA is nowhere near as bittersweet as saying goodbye to the summer/fall CSA. The spring CSA ends at a great time; the farmer’s markets are just starting up, strawberry picking is beginning in the fields, my little container garden is providing herbs for our meals, and I can already see the beginnings of baby hot peppers on our plants. And the summer/fall CSA starts up in just two weeks, so it’s hardly a period of privation. 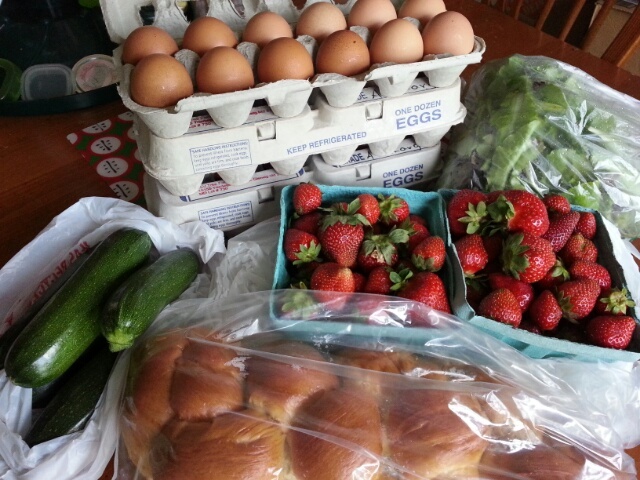 Yesterday afternoon I went to the farmer’s market at Miller Library, just to stock up on eggs. The guy at the TLV tree farm promptly talked me into buying more. Like he said, they’ll be fine for weeks in the fridge… and at under $4/dozen if you buy three, these fresh brown eggs from cage-free hens are comparable to supermarket prices. 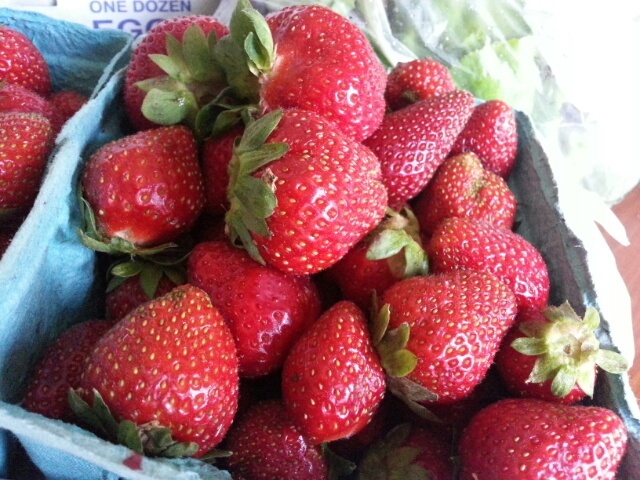 He also talked me into buying twice the strawberries I came for (picked that very morning). Dude is smooth. While I was there, I also picked up a bag of mixed greens from Love Dove, challah from The Breadery, and zucchini from the stand next to the Stone House Bakery. The strawberries came in handy right away; I used them to bribe the Little Prince into finishing his salad greens. The kid will do anything for strawberries. They were juicy, sweet, and perfect. I’m already itching to make strawberry jam. I’ve said this before, but: I really love spring in Maryland. This entry was posted in CSA, local by kat. Bookmark the permalink.